Want to know a secret....? 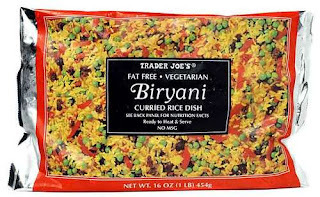 Trader Joe's Biryani Curried Rice Dish makes the perfect side dish to any meal and tastes amazing! It is fat free, vegan, gluten free, and ready to heat and serve. We like to drop a tablespoon of Trader Joe's Coconut Oil in a pan until heated then toss the rice in and before you know it your mouth will be watering as the curried flavor fills the air. Add chili flakes to spice it up or add your favorite protein for a complete meal! Look for it in the frozen section! 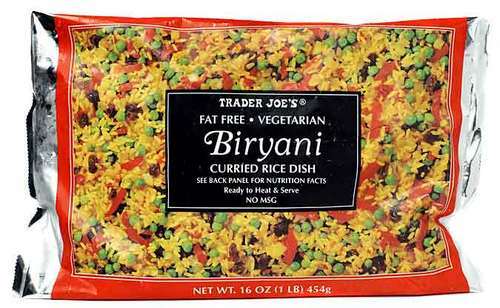 Get nutrition facts for Trader Joe's Biryani Curried Rice Dish. I really like to know what are the spices in the trader joe biriyani rice . It says natural spices ......what spices did they use exactly? I understand they're doing away with it. Please bring it back. I really love this rice dish, I mix it in with other rice's or by it self, I also put it in salads etc. Please bring it back!!!!!!!!!!! If not where else can I buy it? It was awesome...miss it...bring it back...PLEASE! It really is great. Don't understand why it was discontinued. Please bring it back!!!!! I have been going from store to store to find out now that it has been discontinued. I had just discovered it. I really hope they bring it back. It was delicious. PLEASE, PLEASE, PLEASE bring back Biryani rice! It was a main staple of my diet! If not, please consider publishing the recipe so I can make it at home. When are you going to bring back Biryani curried rice??? It is the best! I really don't understand why you stop selling such products. Please bring it back or tell me where I can purchase it. When I heard the Biryani rice dish was discontinued I saved my last frozen bag for two years. Why would TJ ever discontinue something that was so delicious. Can't you please bring it back. You can do so many things with it. Shrimp is the best and great to serve to company.